Tonight in France it’s the “Night of the Museums”. It’s just another of those events that epitomises the special madness that is “being French”. On this one night every museum is open all night, admission is free, and one can only imagine what fun it would be in certain centres when the post-nightclub crowds arrive. Participating in the event is one of those things on our list of things we must do one day, if for no other reason than to save the five or six Euros admission cost. In Digoin, there is a neat little museum recording the history of the river, which one day we will surely visit. It is is on the banks of the Loire right beside the “pont canal”, literally “the bridge canal”, a stone structure carrying the canal safely over the Loire River, rain hail or shine. 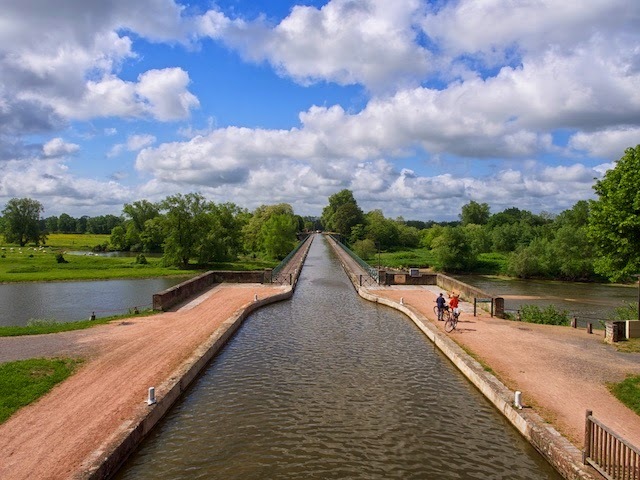 At the opposite end of the pont canal, there is a lock, giving the impression that the canal just ends in mid air, or in mid-forest. The urge that one gets to walk along it to see what is beyond is similar to, but much stronger than the urge to walk to the end of a jetty over the sea. The urge to travel along it, to go down into the darkness of the forest, and find what lies around the bend is stronger still. We thought we had a choice: Museum or move on? Would we stay up late struggling to read descriptions of other people’s adventures, or would we head off into the forest and have adventures of our own? It wasn’t a choice in reality, the night at the museums will just have to get along without us for one more year.